Drought conditions continue in the North Coast. The 2013 calendar year, from January 1st 2013 until present (will be dry through January 1, 2014 at least), has been the driest year on record in the inland Mendocino County area ....going back to 1893 Ukiah records. At Ukiah the precipitation record for calendar year 2013 is 7.67 inches .... this is 22.4% of the average 34.18 inches for this period based upon those same 120 year-old records. Here at the UC Hopland Research & Extension Center, Parson's Creek, a tributary to the Russian River, is not flowing yet, and this morning any small pockets of standing water were frozen over. 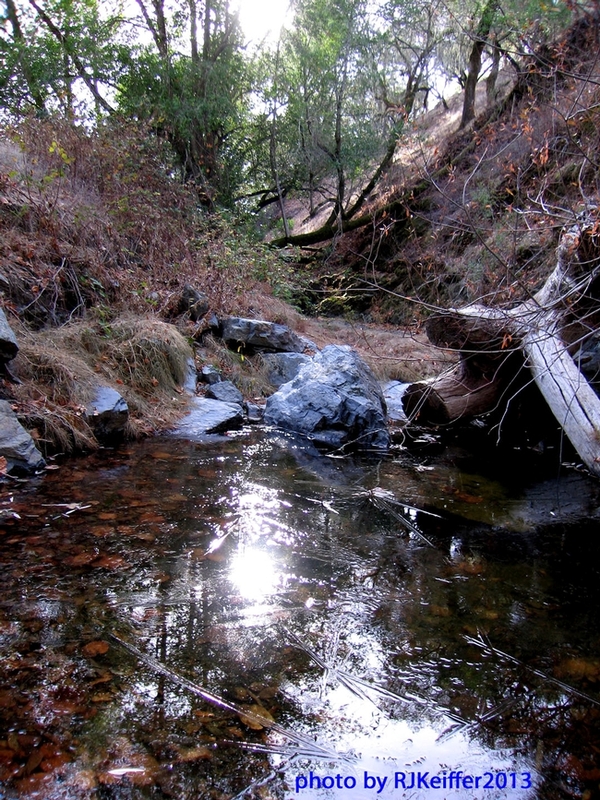 These drought conditions reduce critical nursery habitat for steelhead (sea-run rainbow trout) salmonid fingerlings which must hold over in the streams in which they hatched for one to three years.